Turkey Terminology: Let’s talk turkey about what’s on the label! Heritage: Heritage turkeys are the feathered equivalents of heirloom vegetables. To turkey breeders they’re “standard breeds” — old-school turkeys that look, live and, most important, taste the way turkeys used to taste! Pasture-raised: Pasture-raised turkeys roam around outside and eat primarily grass, so their food and activity level — both of which affect flavor — differ from those of their grain-fed cousins raised in confinement. Pasture-raised turkeys are also likely to be heritage breeds; the factory farm birds are so heavy of breast and short of leg that they can’t thrive out in the open. Organic: According to the U.S. Department of Agriculture, to be called organic, a turkey has to be raised on organic feed: grain- or grass-fed without the use of genetic engineering methods, ionizing radiation or sewage sludge for fertilization. And the birds cannot be given hormones or antibiotics. Kosher: To qualify as a kosher turkey, the bird must be healthy at the time of slaughter and must be killed in a specific manner intended to minimize pain, under supervision of a rabbi trained in ancient Jewish dietary laws. All the blood has to be removed from the slaughtered bird, first by draining, then by a process of soaking and salting. The net effect of all that salt and water is equivalent to brining the bird, an effective although sometimes unwieldy way to enhance the flavor and juiciness of a turkey. Free-range: Free-range refers only to turkeys given free access to the outdoors.They may still be penned, unlike pastured turkeys, which actually wander around grass. Crowded conditions apparently have more impact on turkey health and taste than does access to the outdoors. Fresh: According to Agriculture Department definitions (revamped in 1997), “fresh” simply means the turkey has never been stored below 26 degrees. The term describes a “pliable surface.” The bird may still have been stored for several weeks. For the holiday season, most grocery chains carry fresh turkey. They still generally taste better than “deep frozen” birds and can be perked up further with brining. You may prefer to look for “fresh-killed,” meaning recently butchered and delivered, usually coming from farms closer by. Natural: Fresh turkeys may also calls themselves “natural,” which has no official definition. It is a broad marketing adjective that officially indicates nothing about how the bird was raised, fed, killed or held. Sometimes packaging will further explain that “natural” indicates that the turkey contains no artificial ingredients. If the turkey is defrosted, it should say “previously frozen” on the packaging. “Rock” frozen refer to those requiring longer defrosting time, and these turkeys may have been held a long time after processing. Some Frozen turkeys may also be “self-basting,” injected with a solution of fat, broth, salt and water. This is meant to counteract the drying tendency of the quick-freezing, industrial cold-air process. Factory-raised birds grow so quickly that their meat doesn’t have a chance to develop rich flavor and dense texture. Buy 1 pound per serving when buying a bird 12 pounds or less. Buy 3/4 pound per serving if a bird is more than 12 pounds. No difference in quality, tenderness, or flavor. Tom’s will be larger, but Hen’s have more breast meat. Fresh turkey is highly perishable. Buy fresh turkey just one or two days before you plan to cook it. Pre-stuffed fresh turkeys aren’t recommended because you have no way of knowing if sanitary methods were followed when the bird was stuffed. Choose one that’s solidly frozen. Look for one with no damage to the package, and no pockets of frost under the wrap. Best to leave the turkey in the original packaging. To thaw in the refrigerator, place the bird on a tray and allow 24 hours thawing time for every 5 pounds (3 to 4 days). You can also thaw in cold water, allowing 30 minutes thawing time per pound. Be sure to change the water every 30 minutes. Reach into the thawed turkey and pull out the parts that have been prepackaged or are loose in the cavity. You can thrown them away or use them for gravy, etc. Don’t stuff the turkey until you’re ready to roast it. Loosely spoon stuffing into the neck and body cavity. Do not pack, because the stuffing will not reach a safe temperature by the time the bird is done. Tuck drumsticks under the band of skin that crosses the tail. If there isn’t a band, secure the legs to the tail with string. Most chefs recommend Dressing (stuffing that is cooked outside the Turkey) for a safer food experience plus it’s easier to control the cooking. This is inspired by the chicken-cooking technique of Judy Rodgers, chef and owner at San Francisco’s Zuni Café. It’s a simple process. Salt the turkey a few days in advance, give it a brisk massage every so often to redistribute the salt, and then roast it. The results are phenomenal. Without the fuss and mess of wet-brining, you still get the deep, well-seasoned flavor. And while wet-brining can sometimes lead to a slightly spongy texture, with dry-brining, the bird stays firm and meaty. Note: This is more a technique than a recipe. It makes a bird that has concentrated turkey flavor and fine, firm flesh and that’s delicious as is. But you can add other flavors as you wish. Minced rosemary would be a nice finishing addition. Or brush the bird lightly with butter before roasting. Remember that you should salt the turkey by at least Monday night in order to have it at its best by Thursday, though briefer salting times will work too. Wash the turkey inside and out, pat it dry and weigh it. Measure 1 tablespoon of salt into a bowl for every 5 pounds the turkey weighs (for a 15-pound turkey, you’d have 3 tablespoons). Sprinkle the inside of the turkey lightly with salt. Place the turkey on its back and salt the breasts, concentrating the salt in the center, where the meat is thickest. You’ll probably use a little more than a tablespoon. It should look liberally seasoned, but not over salted. Place the turkey in a 2 1/2 -gallon sealable plastic bag, press out the air and seal tightly. Place the turkey breast-side up in the refrigerator. Chill for 3 days, leaving it in the bag, but turning it and massaging the salt into the skin every day. Remove the turkey from the bag. There should be no salt visible on the surface and the skin should be moist but not wet. Wipe the turkey dry with a paper towel, place it breast-side up on a plate and refrigerate uncovered for at least 8 hours. On the day it is to be cooked, remove the turkey from the refrigerator and leave it at room temperature at least 1 hour. Preheat the oven to 425 degrees. Place the turkey breast-side down on a roasting rack in a roasting pan; put it in the oven. After 30 minutes, remove the pan from the oven and carefully turn the turkey over so the breast is facing up. (It’s easiest to do this by hand, using kitchen towels or oven mitts.). Reduce the oven temperature to 325 degrees, return the turkey to the oven and roast until a thermometer inserted in the deepest part of the thigh, but not touching the bone, reads 165 degrees, about 2 3/4 hours total roasting. If the turkey isn’t quite as brown as you’d like it, you can return the oven temperature to 450 degrees for the last 20 minutes of roasting for better color. Don’t brown for too long or the breast meat will dry out. A room temperature turkey will roast more evenly, so remove the turkey from the refrigerator about a half hour before putting it in the oven. Place turkey, breast side up, on rack in an open or covered roasting pan. For open roasting, cover bird loosely with foil. Roast in a 325° oven, basting occasionally. Remove the foil the last 30 to 45 minutes to let brown. For covered roasting, roast bird with vent open in a 325° oven for 20 to 25 minutes per pound. Uncover and drain. Turn oven to 475° and roast 20 more minutes or until brown. See the chart below for detailed cooking times. Because birds differ in size, shape and tenderness, use these roasting times as a guide. Today’s turkeys take much less time to cook. If a bird is dry, it’s been cooked too long—and the breast meat suffers most. Times are for unstuffed birds. A stuffed bird may cook at the same rate as an unstuffed one; however, be prepared to allow 30 to 50 minutes more. While turkeys take about the same time to roast in regular and convection heat, a convection oven does a better job of browning the bird all over. Un-stuffed turkeys usually require 30 to 45 minutes less roasting time than stuffed turkeys. 10-13 lb. 350° F 165° 1 ½ to 2 ¼ hr. 14-23 lb. 325° 165° 2 to 3 hr. 24-27 lb. 325° 165° 3 to 3 ¾ hr. 28-30 lb. 325° 165° 3 ½ to 4 ½ hr. You’ve calculated the time it takes to cook the turkey, but you want to be absolutely sure it’s done. Here’s how to tell. After the turkey has roasted for approximately the right length of time as indicated on the chart, insert an instant-read meat thermometer into the upper thigh of the turkey without touching the bone. A whole turkey (and turkey parts) is safe when cooked to a minimum internal temperature of 165°F degrees F.
This may be different than the recipe you have! This cooking temperature is a change from previous 180°F for a whole turkey and 170°F for turkey breast. The single minimum internal temperature change to 165°F was recommended by the National Advisory Committee on Microbiological Criteria for Foods. The basic reason most turkeys are dried out is because they are overcooked. In the past, the USDA recommended cooking a turkey to 180 degrees, a sure-fire way to guarantee all bacteria was killed. Problem was, so was all the flavor and moisture. The Turkey Federation continues to recommend 180° because this ensures that the meat is no longer pink yet will remain juicy. Check the internal temperature in the innermost part of the thigh and wing and the thickest part of the breast. For reasons of personal preference, consumers may choose to cook turkey to higher temperatures. Double-check the temperature reading by looking at the juices that flow from the point of insertion of the thermometer. When the juices are clear, the turkey is done. Ignore the turkeys that have pop-up indicators that are supposed to signal when the turkey is done. These indicators (you might call them idiot birds) can be faulty. You don’t want an overly dry turkey. Let the turkey rest another half hour outside the oven before being carved. The residual heat will continue to cook the turkey all the way through, and it will improve the flavor because some of the juices get reabsorbed. There you are, knife in hand and all eyes on you. You are center stage, it’s show time, with all the starving kids and Aunt Martha watching. Turkey carving is a skill you only get to practice once or twice a year, and that makes it all the more difficult. But once you get it done right, your only responsibilities for the rest of the day involve eating and sitting in front of the TV. So relax. Carving the Thanksgiving turkey is easy when you break it down into 10 steps. Before you get started, though, you need to stake out your carving area. Doing the job in the privacy of the kitchen will save you face if the job is less than perfect, but a dining-room performance in front of the whole family is a lot more impressive. Once you’re set up, here’s how to get the job done. 1. Get your tools in order. Some swear by the electric knife, but a long-bladed sharp knife does perfectly well and actually provides better handling. Do not use a serrated blade to cut; it will tear the meat. It’s best to use two knives, one for slicing (10 inches) and a short-bladed one (4 to 6 inches) for trimming and separating joints. Also have a warm serving platter ready, and a pair of kitchen scissors. A carving fork can be used to arrange and serve the turkey, but it can pierce and even tear the turkey slices. You’ll have more control if you grip the bird with your hand, using a clean potholder or napkin to protect your fingers. This may appear a little barbaric, especially if you choose to carve at the table, but use your judgment knowing your audience. Before you even grab hold of the knife, let the roast turkey cool at least 20 to 30 minutes after coming out of the oven. This allows the juices to settle back into the meat, to make it firmer and juicier, plus it will give Aunt Betty plenty of time to make her Bourbon cranberry sauce. After it cools transfer the turkey to a cutting board. Position the turkey so its neck is to your left, if you’re right handed With the scissors, cut through the trussing, taking care to remove all the string or sometimes the bird is held together with wire. If there is stuffing in the cavity of the bird, slice open the neck cavity with an oval incision, then scoop out the stuffing using a long-handled spoon and transfer it to a serving bowl. Remove the drumsticks and thighs, cutting free the entire leg as one piece. Hold the outward end of the drumstick securely, and use the long knife to cut through the skin between the thigh and body of turkey on each side of the joint. Pull the leg out, away from the body, and back. Often the joint connecting leg to the hip will snap free. If not, press the turkey leg down to expose the hip joint, poke the short bladed knife into the joint and cut and twist to sever the tendon. Place the drumstick/thigh piece on a separate cutting board and separate the drumstick from thigh at the joints. Apply pressure at the joint with the knifepoint, twist the knife and cut through to sever the drumstick. Repeat with the other leg. Both thighs and drumsticks may be individually sliced or you can serve the drumstick whole. If you want to slice the drumstick, hold it by the end, tilting it at an angle with the meaty part down, then slice down toward the table. To slice the thighs, turn them skin side down, cut lengthwise along the bone, then slide the knife around the bone to release it, keeping the thigh intact, cut thighs lengthwise into about ½ inch thick slices and arrange the slices on the serving platter. Now it’s time to slice the breast. Insert a fork into the wing or use your hands at the wing to steady the turkey. Wings are left in place to give you something to hold onto to help stabilize the bird. Place the long knife horizontally at the bottom curve of the bird’s breast, just above the wing and cut toward the rib cage, to the breastbone. This cut is the stopping point for each breast slice you cut, and is called a “guide cut” or “base cut”. It allows slices to separate neatly, since all slices will stop at his horizontal cut. Then cut vertically through the breast meat from the top, angling the knife down parallel to the carcass, until the knife reaches the base cut that you made above the wing. Create even, thin slices of ¼ to ½ inches and arrange them on the serving platter. Here’s an method that may be easier if not as dramatic. This approach recommends removing the turkey breast whole and carving it crosswise. Since this technique requires the use of a separate cutting board it may best be accomplished in the privacy of the kitchen. Just above the wing joint, make a long horizontal cut as far into the rib cage as you can. Then, cut closely down along the keel bone (center of breast) to free the entire breast from the bird. Repeat on the other side. Take care to keep breast sections whole, and avoid tearing the skin. Place breast sections skin up on a cutting surface and cut ¼ to ½ inch thick slices, crosswise, through the meat. Keep the slices in place. Use a wide spatula to place the breast half on the serving platter. Remove the wings by pushing the wing down to expose the joint, poke the short-bladed knife tip into the joint, and cut and twist it to sever. Don’t forget the “Oysters” of meat from the hollows in the backbone. 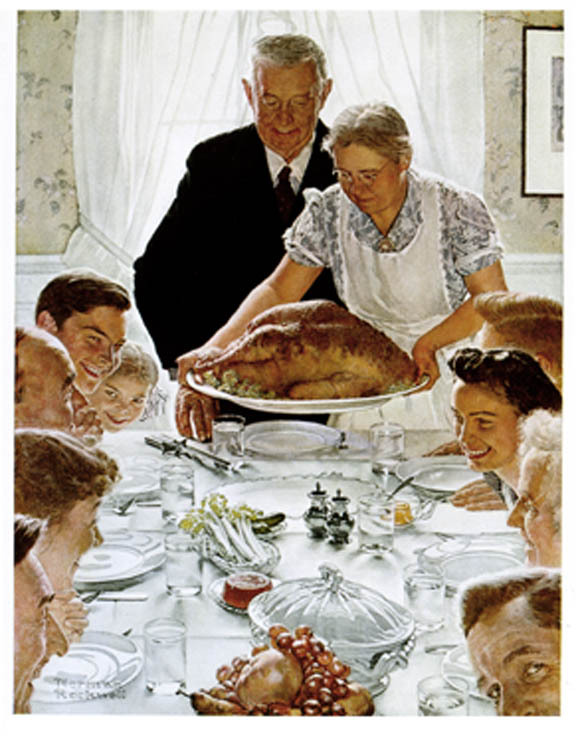 And as you place the knife and fork back on the platter to thunderous applause, you can be thankful that you’ve done your duty, a job well done until next year. Safe food handling after the big meal also is important. Crammed refrigerators make for poor cooling because of reduced air flow around the items. Putting leftovers in several smaller containers instead of one or two larger bowls also helps cool foods faster. When storing leftovers, food safety experts recommend that the temperature of hot food should drop below 70°F within two hours after placing into the refrigerator. Warm or hot foods should not be allowed to sit on the countertop until they reach room temperature before being refrigerated. Ideally, the food should remain above 130° until it is placed into the refrigerator and then it should cool to below 70° in two hours and below 40° in another 4 to 6 hours. The major illness-causing bacteria in cooked meat and gravies slows its growth at around 70° and does not reproduce well below this temperature. Frequent hand washing as well as using paper towels also helps reduce the risk of food borne illness. A new technique (new the past couple of years!). Brining has been the fashionable way to cook turkey, but the Dry-brined method is gaining in popularity!